Facebook has announced that the Android beta testing of its refreshed Messenger app has come to a close and the new version is available to download on iOS and Android devices. It should come as welcome news as the limited beta had an appealing iOS 7-friendly look and added the ability to message real-life contacts who aren't on your Facebook friends list. "Now you can text your phone contacts, even if you're not Facebook friends," wrote the social networking company in today's release notes for the app. "It's easy to add new contacts - just enter a phone number." Facebook's focus on a "reliable mobile-to-mobile messaging experience" means that users won't have to open up other chat programs like SMS and WhatsApp to message non-Facebook friends. The in-app ability to send a Facebook message, text, initiate a phone call, view previously sent photos and browse the contact's timeline puts a lot more information at a user's fingertips. 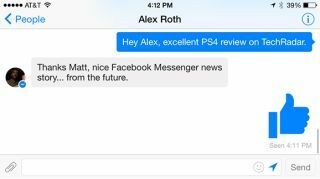 The redesigned Messenger is also faster and feels more lightweight than its previous iteration. Although Facebook is no longer trying to completely co-op SMS conversations on Android, it still includes the convenient chat heads circles that can pop up throughout Google's mobile ecosystem. All of this makes for more instantaneous communication. With Google integrating SMS into Hangouts and Apple having done the same with those highly encrypted iMessages, costly SMSs may be sending SOS messages and not much else. Download the new PlayStation app on iOS and Android ahead of PS4's launch.